Join the discussion on our forums! 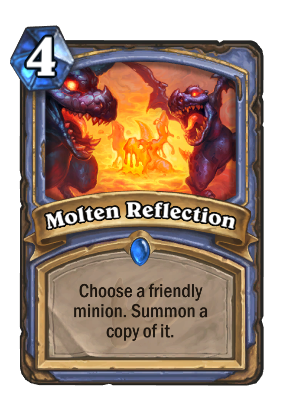 Come discuss Molten Reflection over in our dedicated Molten Reflection discussion topic. Does this spell copy all of the buffs to a minion as well? What about Mechs? If I have a Mech with multiple Magnetized minions combined, does it copy that whole Mech? If so it would be insane value. So, I tried breaking this spell in Wild. I think we don't have the pieces in place yet. I tried copying Flamewaker. Was promising at first as the copy created will trigger off of the spell itself resulting in instant 4 dmg for 7 mana, but even under optimal conditions vs. AI with Emperor Thaurissan ticks, the best you're getting is about 16-24 dmg with 2 Flamewakers and 2 Reflections and some other spells, which sounds amazing but after struggling through an entire game to draw your whole deck.... it doesn't have Competitive potential. Note : In a tempo mage deck with Primordial Glyph and Flamewaker, picking this from the Glyph is insane value. So it has that going for it. I tried building the Antonidas freeze mage, and well.... normal freeze mage is just better. It is faster and more consistant because you need less pieces. I tried copying how-power cards like Rhonin but its just too slow. I tried Sorcerer's Apprentice x2 + Polymorph: Boar x2 + this x2 but again, this eats your entire hand and mana and only deals 16 dmg. And there really is no point trying to break it with Neutral cards because anything this spell can do, Shamans can do way better with Ancestral Spirit and Reincarnate. I insist this card is broken somehow, but I've not yet found how. Will have to wait for future cards. This card is broken. I don't know how it'll break a meta or when, or wether it will be in Standard or Wild in five years, but this card is going to break things. Leeroy Jenkins + Abusive Sergeant + this = 16 damage!!!!!! you don't even need a spell because you can play Sorcerer's Apprentice -> Sorcerer's Apprentice -> Molten Reflection -> Time Warp -> Archmage Antonidas -> infinite fireball. Hogger, Baron Geddon, among others. 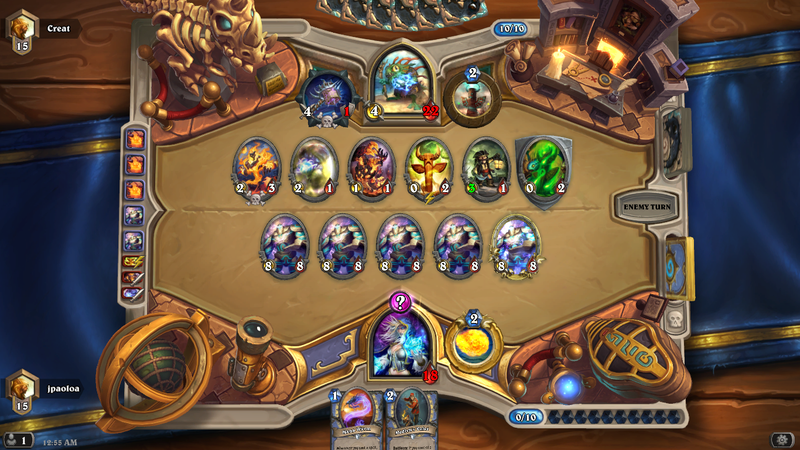 Next turn: Antonidas + Sorcerer x2 + Echo of Medivh. Wild is sure gonna be fun! After two Emperors; Antonidas: 5, Apprentices: 0, Echo: 2, left 3 mana. 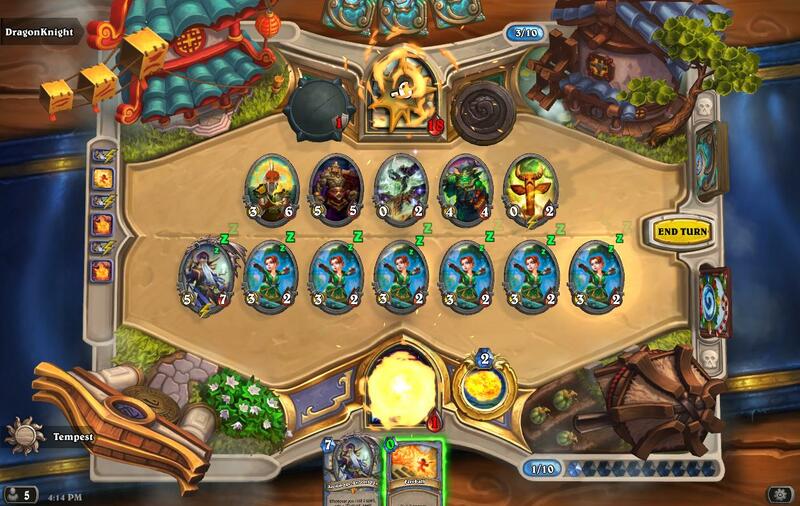 You cannot play last 2 Apprentices for 3 mana, so you don't have 0 mana fireballs that turn without Duplicate on Apprentices. I didn't understand that downvotes!